I saw a picture a few days ago of something baked in a Portobello mushroom cap. I can’t remember what it was but I thought it was an egg at first glance. 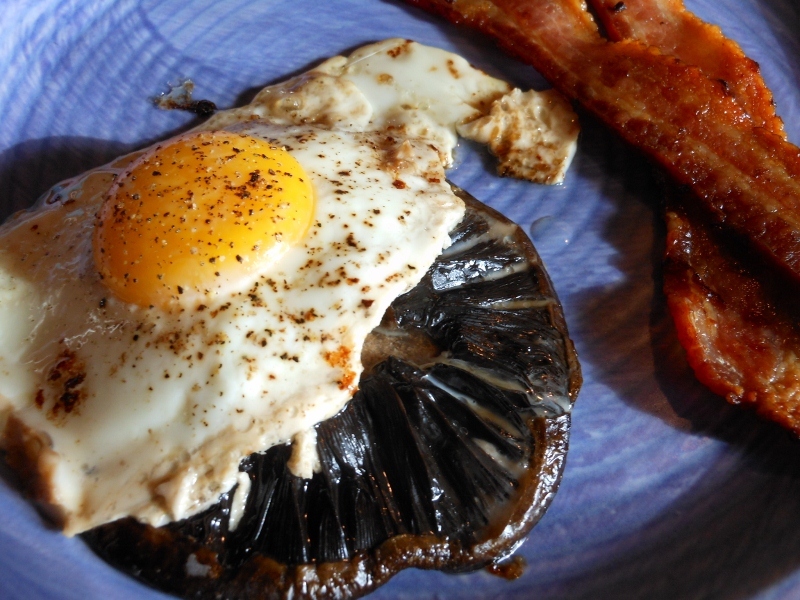 I couldn’t get the idea out of my head so I had to try baking an egg in a mushroom cap for breakfast today. It didn’t work out as perfectly as I envisioned but was very delicious and the results even looked good; I just couldn’t keep the egg in the mushroom cap so I baked it on the side. Heat oven to 350 degrees. 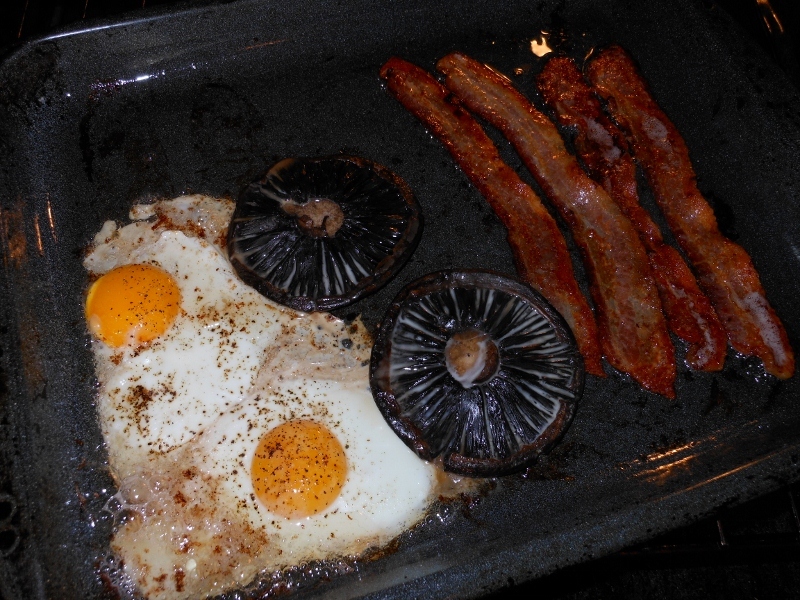 Place bacon and whole mushroom caps on baking sheet and bake for about 10 minutes. Flip bacon and mushrooms over and bake about 5 more minutes. 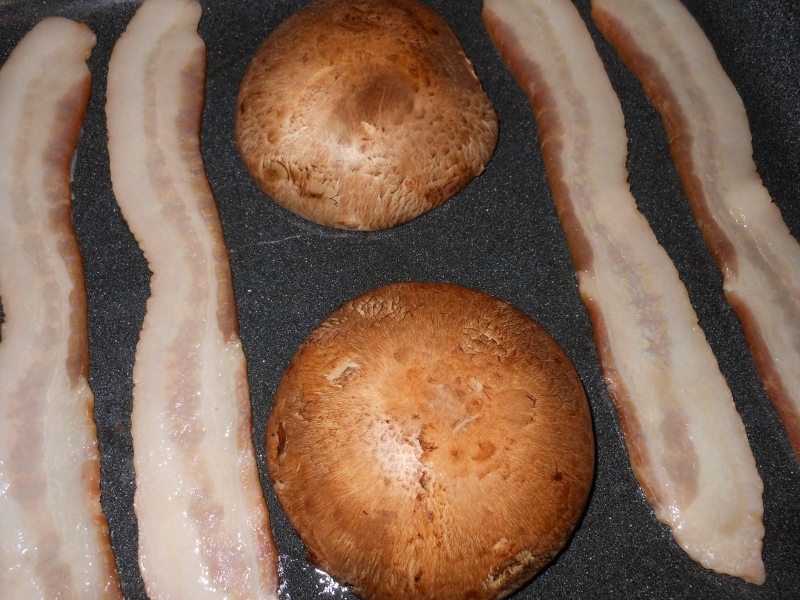 Move bacon to one side and mushrooms to the middle. Crack eggs in corner of pan, sprinkle with salt and pepper, and bake an additional 5 – 8 minutes until eggs are desired doneness. This entry was posted in Entrees, Recipes and tagged bacon, baked, breakfast, eggs, food, mushrooms, portobello, recipe. Bookmark the permalink. Just connected to your site via Dashboard. I’m a huge mushroom fan (always have been) and I’ll take portobellos anytime of day. Sounds like a tasty breakfast.